ANNISTON, Ala. — Blastcrete Equipment Company’s ultra-high pressure X-10 Pump is a reliable, powerful solution for demanding refractory installations and shotcrete applications. Easy to maintain, operate and own, the unit is designed to achieve quick ROI and provide dependable performance over a long product life. The X-10 is a 3-inch swing tube pump capable of pumping up to 12 cubic yards per hour, and can handle aggregate up to ¾-inch diameter. Offering the highest piston face pressure in the industry at 2,200 PSI, it can pump material in excess of 500 feet, horizontally and vertically. To allow simplified cleaning and maintenance, Blastcrete has designed its swing tube pump for easy access to crucial areas. Thanks to a heavy-duty hinge mounting, the 2,500-pound capacity-receiving hopper features easy swing-out capabilities. The flat pack is held in place by four heavy-duty bolts, allowing the spare flat pack to be quickly and easily replaced, virtually eliminating downtime. An optional 2,000-PSI hydraulic pressure washer is available for fast and easy cleaning of the mixer and the pump. A hydraulic agitator is included in the receiving hopper to ensure the mix stays consistent and blended. The agitator’s high intensity mixing action assures that the aggregate materials remain in suspension as the material is loaded into the pump. 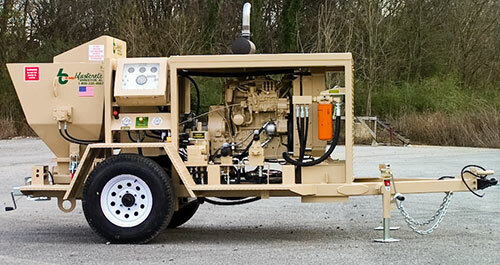 Power options on the X-10 are a V3600, 66-horsepower Kubota water-cooled diesel engine or 40-horsepower electric motor with starter and disconnect, and the machine comes standard mounted on a 6,000-pound single capacity axle trailer. The X-10 is CE Certified, meeting European Union safety standards for equipment operation, and backed worldwide by Blastcrete’s unmatched customer service and support. For 60 years, Blastcrete Equipment Company has been manufacturing safe, reliable and user-friendly solutions for a variety of industries worldwide. With a complete product line consisting of concrete mixers, pumps and related products, Blastcrete Equipment Company is poised to meet the needs of the commercial and residential construction, ICF and SCIP building systems, refractory and underground markets. For more information, contact Blastcrete Equipment Company, 2000 Cobb Ave, Anniston, AL 36202, call 800-235-4867, fax 256-236-9824, e-mail, or visit the Web site at www.blastcrete.com.